There's something going around the Internet that I can't be quiet about any longer - the huge influx of people discussing how they're giving out stickers, temporary tattoos, and erases instead of Halloween candy this year. And I know that this is well-intentioned, because no, I wouldn't want my kiddo to eat too much of any one thing either. But the thing is, children are born with a solid, innate instinct about food that helps them regulate their own food intake. And when we try to regulate this for them by imposing food rules, the result is - simply put - not good. When we limit exposure to certain foods or food shame, we tell not only our children but ourselves that we don't trust them. Which can lead to sneaking food, bingeing on "forbidden" foods in secret or at a friend's house, and then consequent restricting and dieting once even more diet culture rules catch up to us. When we start describing food as good and bad, we start transferring the labels of "good" and "bad" to ourselves. So when we say Halloween candy (or any candy), popcorn balls, and caramel apples are bad, what kids can hear is, "You're a bad kid for enjoying this." This can lead to a destructive spiral and, as mentioned, bingeing and restricting - not a healthy relationship with food. What can we do instead of applying these labels? We can start by treating candy like it's any other snack. Store it with the others, and offer it as an option along with the others - thereby keeping it neutral. We can also guide children (and ourselves!) by becoming more of body observers and reflectors instead of controllers. Asking questions like "How eating that make you feel?" helps children increase their body awareness and tune into their natural intuition. Say you're building a Lego tower and you want it to be tall and mostly red. You have a pile of red bricks and a few blue. If you want to build your tower, is it easier to add more and more red bricks, or focus your energy on removing the few blue that you have? It's the same with children and eating. It takes a lot of tries and offers for a child to accept a new food (I've heard numbers anywhere from 10-20 offers), but demonizing dessert and candy isn't included in those tries. So, to get kiddos to eat from a variety of food groups, we have to offer a variety of food groups - not cut back on them. I love this article from Bon Appetit that has heavy input from Emily Fonnesbeck. In a nutshell, there's a concept called the Division of Responsibility that states parents choose the what, when, and where of meals - and kids decide how much they eat and whether or not they want to eat. This helps candy fit into the snack schedule just as any other food would. Offering candy as a snack option, and treating it just like any other snack helps avoid that "forbidden fruit" mentality - and allows children to pick what they want without feeling crazy trying to get what they can't have. Parents and adults still decide when that snack is available and where it's eaten - but children are free to pick candy from the list of options. It's possible that they'll choose candy for every snack for a while. But it's been shown that if we're allowed to eat a food every day, the overall energy consumption from that food goes down over time. Simply put, candy becomes old news instead of something so exciting it has to be rationed, and we start making more varied choices. And then sometimes we choose candy again anyway, and that's okay too. If you're looking to do some good with your Halloween candy, consider getting allergy-friendly treats to pass out! Food Allergy Research and Education's Teal Pumpkin Project is dedicated to making Halloween fun for every child, including the ones that have food allergies that would get in the way of normal trick-or-treating. 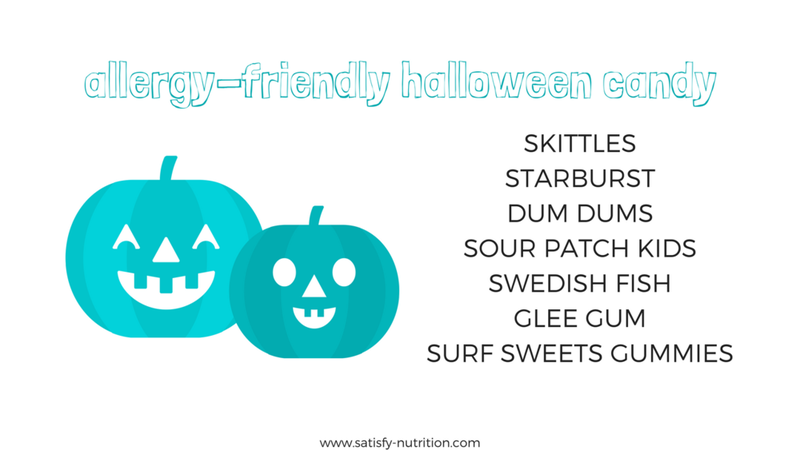 Just print a sign and provide some non-food treats or allergy-friendly candy!